Way, way, back when, I had a small simple sketch (doodle) of a face that I liked. Every time I reviewed my earlier sketch’s, I saw this “face” and as much as I liked it, I couldn’t seem to develop it into a finished drawing. Over time, I also noticed that I started to accumulate other small subject’s in the sketchbooks that never found a home as a finished drawing. 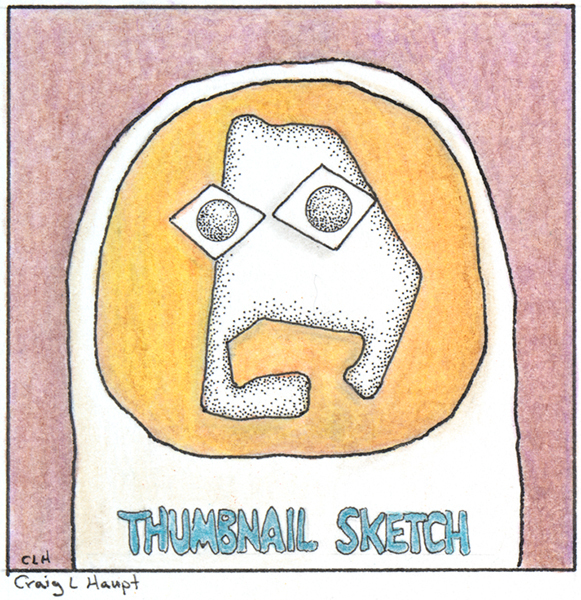 During my tenure as an art teacher, I created a ditto, called a “Thumbnail Sketch Sheet” (with a drawing of a thumb to one side of the title and a nail to the other side). Beneath were four outlined squares for my students to create four different ideas for the current art lesson. One of which would be used for their final composition. The other three were tucked away in their file folder, also never to find a home. After years of an ‘on again/off again’ mission to find a home for these doodles, there came an evening, four years ago, when I remembered the Thumbnail sketch sheet and wa-la, an idea, I traced my thumb for a pattern and found a home for my “misfit” doodles. The outlined box surrounding the thumb is 2 1/4” (56mm) square. The thumb outline is enlarged from my original thumb size to accommodate a small drawing, but it still only measures 2” (51mm) from the bottom border to the tip of the thumb. While these postings of the “Thumbnail Sketches” will not be in any chronological order, this first post is that initial “face” sketch that started me on this road.